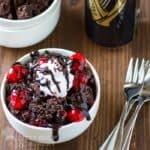 Guinness Chocolate Cake topped with Guinness whipped cream is decadent, velvety, and not overly sweet. If you love chocolate cake, you'll love this recipe! Place the cake mix in a medium bowl. Add the sour cream, vegetable oil, eggs, and Guinness. Mix well. Spray the slow cooker with a baking spray (or just coat with a little vegetable oil if you don't have baking spray). Add the batter to the slow cooker and cook on low for 2 to 2 1/2 hours (until the middle does not jiggle when you shake the slow cooker). Place the heavy cream in a medium bowl. Beat with a hand mixer until the cream begins to thicken. Add the sugar and Guinness, and continue to beat until the cream is stiffened. Don't worry if the batter seems a little thin, that's normal. Don't skip spraying the slow cooker with a non-stick spray or your cake will stick. I recommend making the whipped cream right before serving for best results. You can make it a few hours ahead of time, however. Leftover whipped cream can be stored in the refrigerator for a day or two. It will lose some of its fluff but it will still taste good! This cake can be served by itself, with the whipped cream, or for a super-special dessert you can upgrade it with fresh cherries, cherry pie filling, and/or chocolate syrup. Yum!